Mass Effect: Andromeda is still coming out in early 2017, EA has confirmed, but at least we'll hear more about it at E3. BioWare general manager Aaryn Flynn gave a quick update on the sci-fi RPG's progress on Mass Effect's official site, doing a bit of cheerleading and expectation setting all in one go. "As we’ve been playing the game at the studio recently, it’s showing us that we’re taking the game in the right direction", Flynn wrote. "But we also know we need the right amount of time to make sure we deliver everything the game can be and should be – that’s our commitment from all of us to all of you. "Because of that, Mass Effect: Andromeda will now ship in early 2017. We can’t wait to show you how far we’re all going to go. We’ll see you at the EA PLAY press conference on June 12, with an update". 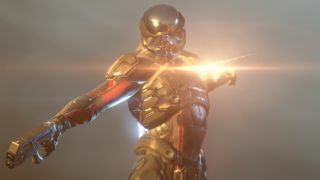 Andromeda will incorporate Mass Effect staples like intricate sci-fi stories and third-person shooter action, though Flynn added that Andromeda will expand on the original trilogy in three major ways: more freedom, new uncharted worlds to explore and people/creatures/relics to meet, and an improved overall experience built on EA's homebrewed Frostbite engine. We'll just have to wait until early 2017 to play it. Assuming EA doesn't delay it again. Please don't delay it again.